HTC's declared Q2 results last week that were an improvement over a weak Q1, but still below expectations. Both revenues & profits missed estimates, but it is the monthly revenue pattern and margin trends that concern me the most. The trends show that HTC is overly dependent on the high-end smartphone market that seems to becoming increasingly competition. 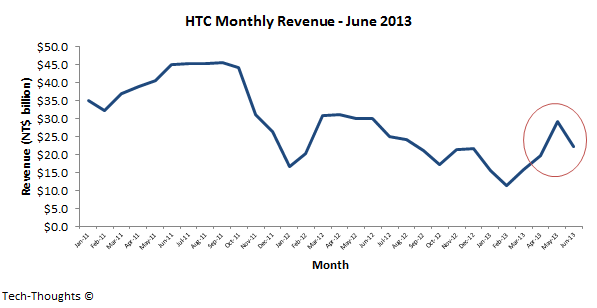 The chart above shows HTC's monthly revenue trend up until June 2013. As we can see, the HTC One launch caused a revenue spike in May. The spike was delayed because of supply issues that caused shipping delays. More importantly, the temporary spike is a clear indication of being present in an overly saturated high-end smartphone market. If HTC's product portfolio was diversified, the spike would have been a lot smaller relative to the revenue base. HTC's focus on the high-end smartphone market also affects its margins, but not in the way one would assume. The chart above shows that HTC's gross margins have dropped over the last few years, which is natural with increasing competition. 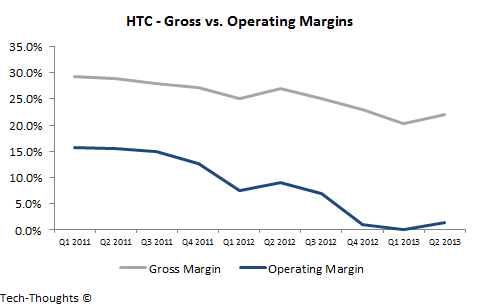 It also shows that the gap between HTC's gross margins and operating margins has been increasing. This has been caused by proportionately higher marketing expenses in the face of declining sales. While declining sales are a part of the problem, HTC's cost structure seems to be partly responsible as well. Most analysts think that the lack of marketing scale is HTC's biggest problem. That is only so because HTC's focus lies completely in the high-end smartphone market and HTC cannot make up for it by moving the same cost structure any further up market. Most Asian vendors don't seem to have this problem as companies like Xiaomi, Huawei, etc. make gross margins of about 20% (same as HTC) and operating margins of about 10% (much higher than HTC) on hardware. These vendors have been moving upmarket and pressuring margins of high-end vendors. If HTC cannot adjust its cost structure and increase the breadth of its product portfolio, an acquisition may be the best possible outcome.